The Patrol Helicopter is an aggressive NPC to hostile and geared players. It travels to each Rad Town but will veer off course if it spots or gets shot at by a player. Players can have up to 2 pieces of clothing on without the Helicopter attacking them, but it will turn hostile if the player has any type of ranged weapon (excluding the Hunting bow). If the player shoots and hits the Helicopter, it will return fire. 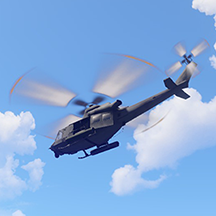 If the player hides after the Helicopter starts shooting at them, it will patrol the area for 30 seconds before leaving. The Patrol Helicopter is equipped with regular and incendiary rockets as well as a machine gun. During a fight, the helicopter will shoot rockets at any structure occupied by its targeted player. If the player is in an area where they are building blocked, only incendiary rockets will be fired at them. Due to its high HP and damage output, it is best to avoid attacking the Patrol Helicopter without a lot of medical supplies and ammo. The Patrol Helicopter has two rotors, one for the main blades and one for the tail. If both are destroyed, the Patrol Helicopter will be destroyed as well, regardless of its prior HP. The 2 biggest things to be aware of with the Patrol Helicopter is how it behaves when it is going to rocket and how important shooting the rotors is. With this awareness, you can down the Patrol Helicopter with as little as one mag from an Assault Rifle (if your aim is perfect) in just a couple of rocket passes as a solo player. As a larger group it should be no problem to down the Patrol Helicopter in seconds as long as you shoot out the rotors. The rotors have about 1/7th of the health of the main body, and can theoretically be destroyed with 28 rounds from an Assault Rifle, the main body takes 200 rounds. The m249 and the Bolt Action Rifle are both do more damage and are more ammo efficient but the m249 is hard to acquire and the bolt is a little slow, meaning more rockets. Once you do get an m249 it becomes much easier to down the Patrol Helicopter, as the sustained fire can really tear up the rotors. Also, a tip for not getting wrecked by the machine gun. It fires in bursts. Bait a burst and note where the Patrol Helicopter is moving to, then pop out from cover at a good shooting point for that spot. You'll avoid a lot of bullet damage this way. Hopefully these tips help, and happy rusting! the chopper can sometimes bug and stay and patrol the place for 15 to 30 min witch it did to me and my friend on a dome run. just keep that in mind. Metal Vertical embrasure Metal Embrasures are great for ducking behind when fighting a helicopter. They are NOT great for protecting yourself against any type of rockets though. Tool Cupboard Have a friend place a TC and authorize on it for you, then leave the area. This will prevent the helicopter from using high explosive rockets by tricking it into thinking you're in someone else's base. Auto Turret Keep an auto turret handy to deploy near the crash site to keep people from stealing the loot. You can pick it back up when you're done by using a building hammer. High Quality Metal Long after the fires go out, the helicopter fuselage will cool down enough to mine with a pickaxe. This is an excellent way to score 50-75 High Quality Metal and even a CCTV camera if you're super lucky.